Caribbean Stud is a poker game created by casinos to optimize their house profits. 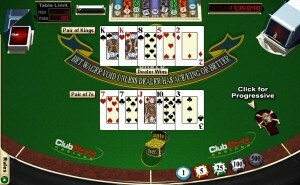 Like other casino card games, it utilizes the standard 52-card deck. But whereas other poker games are played strictly between the players (with a portion of each pot paid to the house for the privilege), Caribbean Stud poker pits the players against the house, eliminating variables like bluffing. As its name implies, Caribbean Stud poker borrows on the rules of other stud poker games. If you have experience playing stud poker, then you will have no trouble transitioning to Caribbean Stud. The big difference here, of course, is that players are competing against the casino’s dealer instead of each other. As a result, all of the players’ hands are dealt face down to eliminate player advantages like card counting, and only one of the dealer’s cards is revealed. To play a hand of Caribbean Stud, players must place an ante in the appropriate box on the table. Some Caribbean Stud games also offer progressive jackpots; to be eligible for these jackpots, players must make a side bet at the same time that they ante. Once all of the initial bets have been placed, the dealer starts each hand by dealing five cards face down to each player and then five cards face down to themselves. The dealer will turn over one of their cards. The players can then view their hands but are not allowed to discuss or reveal their cards. In live Caribbean Stud poker, players may look at their cards just once and then must return them face down to the table. In online Caribbean Stud poker, players can look at their cards at any time. Players that wish to stay in the hand will place a bet that is twice their original ante. Players that wish to fold will forfeit their ante. Once the second round of bets have been made, the dealer will reveal their hand. According to house rules, the dealer must have at least two high cards – an Ace and a King – to proceed with the hand. If the dealer does not have a qualifying hand, then all active players will receive even money on their antes, and their second bets will push. If the dealer’s hand and a player’s hand tie, then that player’s ante and raise are both pushed to the next hand. Players that have made a progressive side bet can win regardless of the dealer’s hand, but they must receive at least a flush to earn a payout. To win the progressive jackpot, players must receive a royal flush.